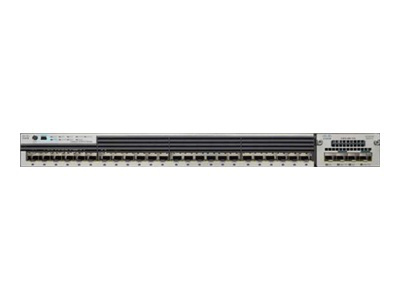 The Cisco® Catalyst® 3750-X Series Switches are an enterprise-class lines of stackable and standalone switches, respectively. These switches provide high availability, scalability, security, energy efficiency, and ease of operation with innovative features such as Cisco StackPower, optional network modules, redundant power supplies, and Media Access Control Security (MACsec) features. The Cisco Catalyst 3750-X Series with StackWise® Plus technology provides scalability, ease of management and investment protection for the evolving business needs. The Cisco Catalyst 3750-X enhance productivity by enabling applications such as IP telephony, wireless, and video for borderless network experience. - Cisco StackWise Plus technology for ease of use and resiliency with 64 Gbps of throughput.